In this notebooking pages e-set, you will find a variety of themed pages that your children may use to record what they have learned about particular character traits. We especially use the first three formatted pages to notebook specifics about the character trait (or seed) being studied that week. We record a definition of the trait. Then each child determines which habits and attitudes need to be “uprooted” or “weeded out” in order to give room for this character “seed” to grow. Then they list specific new habits that should be cultivated. (There are headings for each of these on the pages.) The second page gives them room to record what God’s Word says about this character trait and the third page gives them space to journal their response(s) to all they have learned. Each week, I copy the new character trait and an appropriate Bible verse on a 3×5 card and add it to our Scripture memorization box. We practice these daily. The Bible verse is also used for copywork during that week. One terrific resource I have found to aid us with our notebook study is Character Journal. They have a very detailed and organized summary for many character traits as well as a chart that groups character traits by spiritual gifts. I print out a copy each week for each child’s notebook. 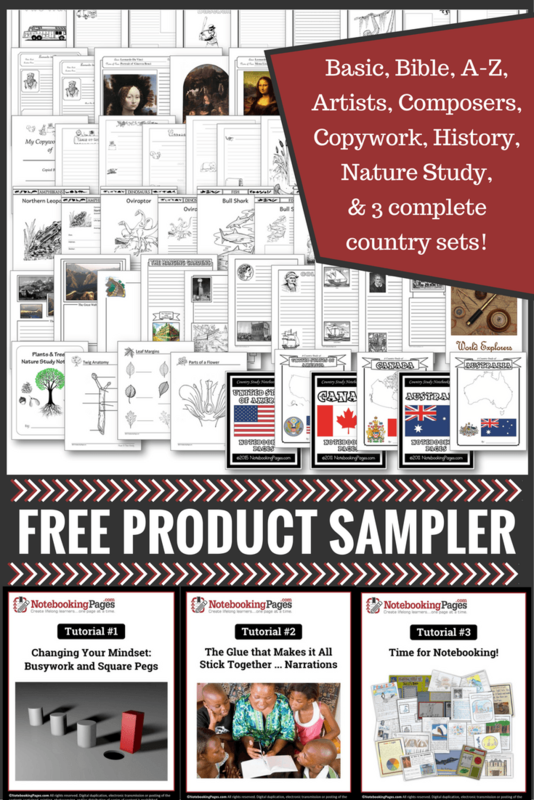 There are about 20 additional theme pages included that may be used in a variety of ways to add more depth to your character study.